Hello guys, i am back with my new post about single point cutting tool. in this post you ca have all the information about single point cutting tools. Here we will discuss the nomenclature of single point cutting tool, its parts and tool signature. in the post you can also read the types of cutting positions. What Is A Single Point Cutting Tool? Metal cutting tools are used for machining process in the metals. 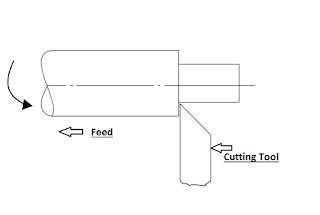 Metal cutting is conventional process of machining. These tools are used with machines. Machining process is used to provide the required shape in specimen by material removal in a work shop or tool room. These tools are of two types – 1) Single point Cutting Tool, 2) Multipoint Cutting Tool. Single point cutting tool is the cutting tool which has only one cutting edge. These tools are made of High Speed Steel so these tools can be operated at high RPM. In this only one sharp point is able to remove the material from the specimen. This tool is associated with the machine such as lathe and shaper machine. Then it is subjected to the specimen to perform the machining operation. These tools can be used for turning, shaping, planning etc. 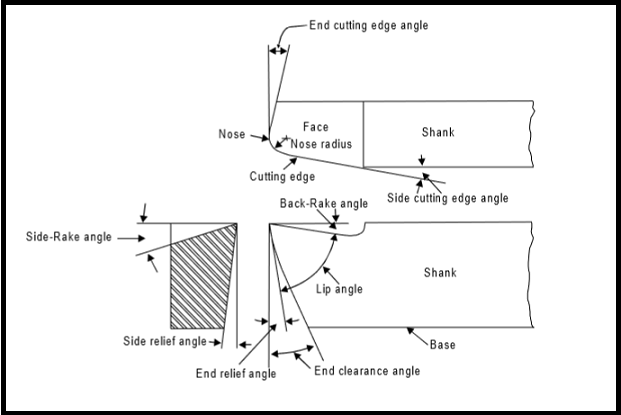 These are the types of cutting based on the position of the tool with respect to the specimen and the location of the cutting edge. In the orthogonal cutting the tool is set as perpendicular to the axis of the work-piece. This position is generally for turning. 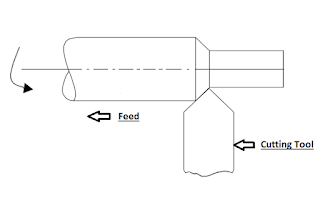 This is a two dimensional metal removal position of tool. This position is generally to provide a taper in the work-piece. In this position of tool the edge of tool is given an angle. It is a three dimensional metal removal process. Shank:This is the extended body of the tool that is used by machine to hold the tool. Face:This surface is very important in the tool design. The chips of the material after cutting will slide on this face and leave the tool after sliding. Cutting Edge:These are the edges on the face of the tool. This is main part of the tool because the material removal is to be done by these edges. There will be two cutting edges on the tool. These are side cutting edge and end cutting edge. These edges intersects at nose. 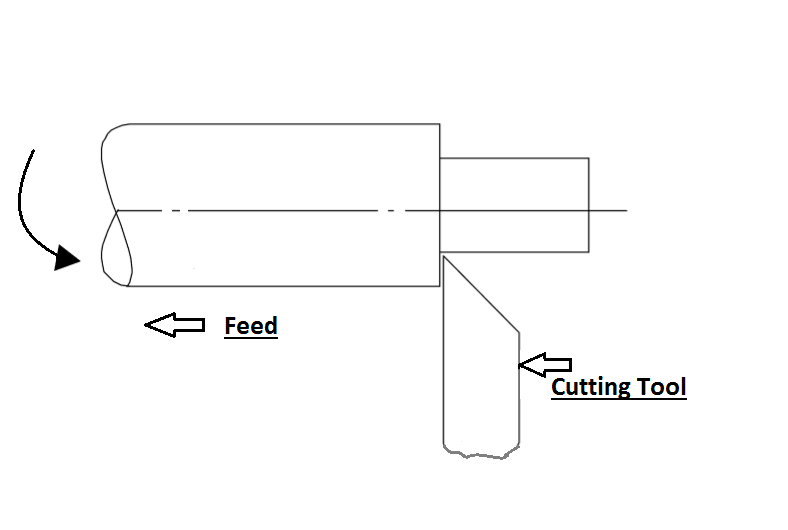 Side cutting edge is the major cutting edge in the tool. Flank:Flank is the surface below the cutting edge and above heel is called flank. These are more than one surfaces. Nose:This is the tip of the tool. And it is the actual cutting point in the tool. It is the intersecting point of end cutting edge and side cutting edge. It is also called lead angle. It is the angle between side cutting edge of the tool and the side of shank. This angle is important for turning operation and also for removal of chips by sliding on the face. End cutting edge is the angle between the end cutting edge of the tool and the line normal to the shank of the tool. This angle is important to provide the clearance between specimen and the cutting edge of the tool. Side relief angle is the angle between the part of flank below the side cutting edge and the line normal to the base of the tool at the right angle to the side. This angle is essential to prevent the interface while the tool enters into the work piece. The angle is provided to enable the relief between the side flank and job work. If the extra side clearance is provided in the tool then that is known as side clearance angle. This angle is the secondary angle just below to the side relief angle. 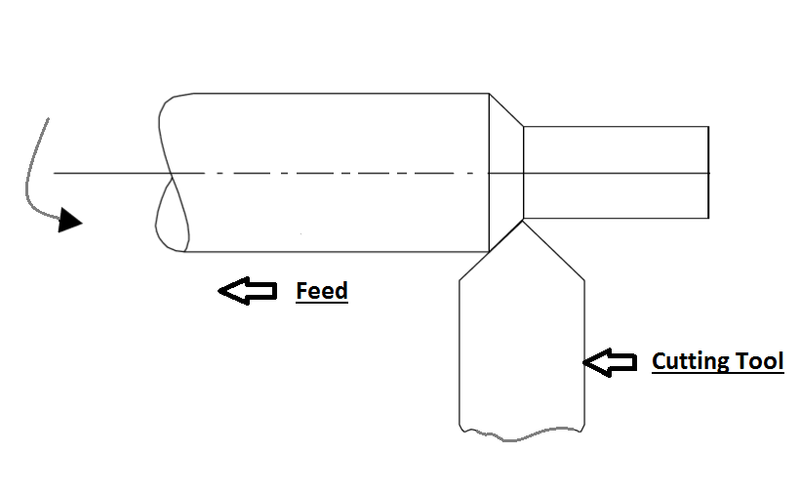 End relief angle is the angle between the part of the end flank just below the cutting edge and the line normal to the base of the tool at the right angle to the flank. This angle provides the facility to the tool to cut the material without rubbing on the job work. If the extra clearance is provided on the tool then that is called end clearance angle. This angle is the secondary angle just below to the end relief angle. 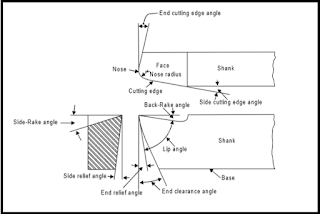 Back rake angle is the angle between the face of cutting tool and a line parallel to the base of the tool measures in a normal plane through the side cutting edge of the cutting tool. Back rake angle is helpful for removing the chips after cutting. When the slope face is downward toward the nose, then this is called negative back rack angle. And when the slope is upward towards the nose. It is known as positive back rake angle. Side rake angle is the angle between the surface of the flank just below the point and the line downward from the point normal to the base. In the single point cutting tool side rake angle is one by which the face of the tool is inclined sideways. This angle is responsible to determine the thickness of tool after the cutting edge of the tool. Side rake angle is provided to provide the clearance between tool and work piece to prevent the rubbing of the job work with the end flake of the tool. This is all about single point cutting. your queries are welcome in comment section. This is a very interesting topic. It reminds me of my years in school. Great blog.